What makes #Samsung one of the best smartphone manufacturers is that the company continues to provide support to their old smartphone models. The #Galaxy #S5 for example which was released in 2014 was first running on Android KitKat. Several software updates later the phone is now running on Android Marshmallow. While most owners of this phone have already successfully updated the phone software some are having problems with it which is what we will be discussing today. 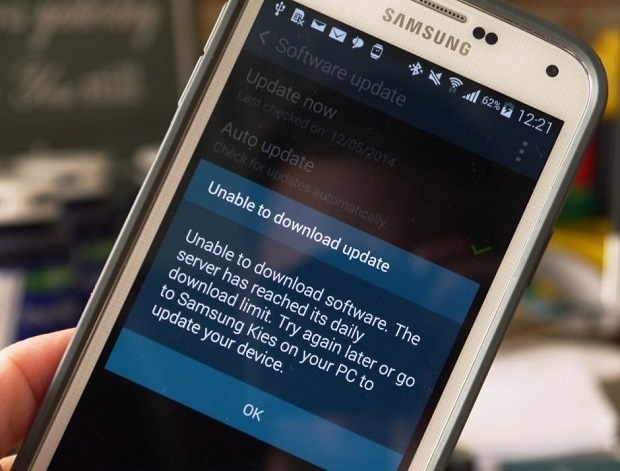 In this latest installment of our troubleshooting series we will tackle the Galaxy S5 software update is temporarily unavailable issue & other related problems. Problem: When I try to update my phone I get a message “Software update is temporarily unavailable. Try again later.” The phone is not currently activated and I think this may be the problem. It’s a Verizon phone. Is there any way to update the phone without having it activated? Solution: Since the phone is not yet activated then it will be unable to access the Verizon servers that hosts the update. In this particular case you will need to work on activating the phone first then you will be able to get the latest software update. Problem: While on wifi, at home, I am not able to install AT&T updates. The updates download fine, the system starts update and reboots phone. Once the phone reboots in the upper area of the screen it shows in blue letters “recovery booting” and shows updating at the bottom. At 1% or less it says update failed and restarts back to normal operation. I have over 2 Gb of space available. This started after the update to Lollipop. I talked with an AT&T rep at their large store and he replaced the sim card which didn’t change anything. I have tried a soft reset but not a factory reset. I have tried to initiate through safe mode but did not succeed. I have downloaded Kies and associated software it doesn’t show any updates needed. Any suggestions before a hard reset? Solution: Since the update downloads without any issue then we can eliminate any connectivity related problems that could be causing this. The problem occurs during the installation of the downloaded file. This could either be caused by lack of internal storage space or a glitch in the phone software that’s preventing the device to be updated. Here’s what you need to do before doing a factory reset. Try to free up at least 7GB of internal storage space in your phone. Move your photos, music, or video files to the microSD card. Uninstall any app that you rarely use. Free up more space by wiping the cache partition of your phone from the recovery mode. Check if you are now able to update your phone. If you are still unable to proceed with the installation then backup your phone data then do a factory reset. Problem: I got a notification that there was a software update available so I let it download, let my phone restart and everything, didn’t leave wifi area. I got the message that the install was interrupted- several times. This has happened before too and I don’t know if it really did update or when it did. I downloaded kies as instructed online, cleared cache and tried to clear memory for it to download (I can only get 4.5 GB). Nothing came up on kies as it said it would and i tried downloading/updating the software again on my phone and it said “current software is up to date.” But my “android version” shows it’s still only 5.0 and clearly there are more current versions. Is there anything further I can do? Solution:A glitch in the installation of the update process may be causing this and marking your phone as already updated. Try wiping the cache partition of your phone from the recovery mode first then check if the issue still occurs. If it does then your last choice is to backup your phone data then do a factory reset. Problem: Since a few months my phone wants to update to a newer version of Android, yet it always stops at like 26% and goes into error. I honestly do not want to run an update from my pc since I am scared to ruin the phone’s software completely. Solution: Try to check if the issue is caused by connectivity problems by downloading the update while your phone is connected to a different Wi-Fi network. If the problem still occurs then the next step is to check how large is the internal storage free space. You need at least 7GB of free space to update your device. If necessary you need to clear up the internal storage space by clearing the cached data of the phone, moving your data ( photos, videos, music) to the microSD card, or uninstalling apps that you don’t really use. If the issue still remains then you should consider doing a factory reset. Make sure to backup your phone data before doing this. Once the reset is done proceed with downloading the software update. Solution: Do you have a cloud storage solution installed in your phone? This includes services such as Dropbox or even Google. If you are unsure of backing up your data to the cloud you should try using Kies or Smart Switch. This is a software that you install to your computer which helps automate the backup process. You will need to connect your phone to a computer to do the backup. Once you have performed the backup I suggest you just do a factory reset. This will delete all data on your device and restore it to its original condition. As soon as the reset is finished proceed with downloading the update. Problem: Hi i’ve been trying to update my s5 for about 2 months to marshmellow. After it finally downloads and it goes through the reboot process it fails and i have to start all over. The developer option is on i was wondering if this is the problem for it failing. Please help dont know what else to do. Solution: Having an active developer option will not interfere with the update process. I’ve listed the troubleshooting steps that you need to do to fix this issue. Move to the next step if the current step you performed fails to work. Try downloading the update while your phone is connected to a different Wi-Fi network. This eliminates the possibility of the problem being connectivity related. Start the phone in recovery mode then wipe its cache partition. This deletes the temporary data in your device which could cause this issue. Backup your phone data then do a factory reset. Once the reset is done download the update again. Related Problem: I’ve had this phone since June 2015 & I’ve never had a software update available, although I get onscreen notifications stating a software update is available only when I double press my home screen button to access the S Voice feature. When I click search for update, it tells me software is up to date, check back in 24hrs. Solution: Sometimes the issue could be caused by the carrier servers. If too many people are trying to get the update the servers may become overloaded which is why some people who wish to get the update are asked to try again at a later time. If you are constantly getting this message then the problem could be caused by a glitch in the phone software. The best way to deal with this is to backup your phone data then do a factory reset. Once the reset is done check for the update again. I had Samsung S5 since I was with Verizon, just few months back I have join T-Mobile and kept same S5. That means I have change the carrier and phone is active but still I am getting message that temporarily service unavailable. I have an old S5 that I am giving to one of my kids. It’s a Verizon phone but I am not activating it to use a phone, just something they can use on wifi. I did a complete system restore and loaded in the new profile, set up the wifi, but still won’t do the system update. It otherwise seems to be running normally (streaming and downloading Play apps via wifi, etc).